Sound "The MC-One Special's frequency response was markedly free of anomalies"; very slight "cream"-colored tonal signature, but also slight dryness in the mids and a slight peak in the upper midrange. Features A "hand-built, custom-made" van den Hul moving-coil cartridge; high-output version for use with moving-magnet phono sections is also available. Use Higher output allowed Tom to match its volume level with that of his digital front-end; "almost total lack of groove noise and distortion." Value "A fine cartridge given its comparatively modest price, and no doubt it has much of the sonic flavor of the much more expensive (and acclaimed) van den Hul cartridges." Many audiophiles mistakenly think that a phono-cartridge upgrade will transform their analog setups, modernizing an otherwise outdated rig. In almost every case, this is not true. Yes, upgrading from an entry-level cartridge to a better model will improve the sound of just about any turntable -- although the turntable itself is the greatest determinant of the sound, followed by the tonearm, and lastly the phono cartridge. So spending $2000 on a cartridge to be used on, for example, an inexpensive 1980s direct-drive turntable makes little sense, which is why nobody would do it. It is far more practical to upgrade to an entry-level high-quality turntable first. That is not to say that you can take a sophisticated turntable and throw on a cheap tonearm and cartridge. You would likely not be satisfied with its overall sound. All constituent parts of an analog system are integral and will determine the final sound. Yet even a high-priced turntable and your associated equipment will reveal the improvements in the choice of phono cartridge up to a point, and then only very slight differences are likely to be heard. If you are lucky enough to have a turntable/tonearm/cartridge combination and an associated system that will reveal these slight differences, it might still only be a matter of taste whether one cartridge is better than others. Of course, there are exceptions to this rule, and weeding out mediocre cartridges is awfully difficult with a product that you are likely to purchase solely by means of a recommendation or its reputation. Retailers that have a try-and-buy policy with phono cartridges are rare. But seasoned audiophiles who are into analog already know this. And they also know that with all good phono cartridges (and with all equipment in general, I assume) the goal is an unadulterated version of what was encoded on the disc -- transcribing the records grooves into what sounds like the master tape used to make the record. These days, high-grade cartridges seem to exhibit many of the same sonic traits; that is, they come as close as the technology can to revealing as much of the original recording as possible given the financial limitations of design. Those limitations are what come into play more than any other factor, and this is why phono cartridges sound different. The $1500 USD van den Hul MC-One Special moving-coil cartridge is shipped in a 4 1/2" x 3 1/2" x 2" gold embossed wooden box. Upon opening the gold-toned clasp, you see the long list of specifications for the cartridge written on the inside of the cover, and under a clear-plastic protector is packed the cartridge, two Allen headshell screws and an Allen wrench. You can use these screws or your choice of standard screws. A clear plastic stylus guard is attached to the front of the cartridge, and this is removed by sliding the guard forward. Also included is a small level that you are supposed to rest upon the headshell to make a gross assessment of the azimuth. 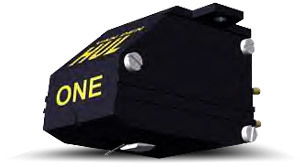 Van den Hul says that the MC-One Special is a hand-built, custom-made cartridge. They go on to say that the "Special" designation is an indication of the important improvements over its previous version (the MC-One, sans Special). It has a thicker frontpole and an extra small magnet. These improvements are said to enhance the cartridge's resolution and output voltage. For those interested, the MC-One Special has a tracking force of 13.5 to 15 mN, compliance of 28 microns/mN, channel separation of <35/30dB, an equivalent stylus tip mass of .35 mg, and a recommended load impedance of 200 ohms. Many of the specifications are similar to those of my reference Lyra Clavis DC. Even the recommended tracking force was similar, about 1.5 g. Incidentally, van den Hul also makes a high-output version of the MC-One Special, calling it the MC-One H, for use with standard moving-magnet phono inputs. Setting up the MC-One Special was uneventful. It has standard threads for its headshell screws, and it was as easy to set up as any cartridge Ive used. It helps that the Triplaner tonearm used for this review rotates a full 360 degrees, so installation without any obstructed views and with everyday tools is possible. Just a small screwdriver (or you can use the provided Allen wrench) and needle-nose pliers were needed -- along with the alignment tool supplied with the tonearm. At first listen, the most significant difference between my reference Lyra Clavis DC and the van den Hul MC-One Special was the MC-Ones higher output, which is .65mV opposed to a relatively low .35mV for the Clavis DC. Even though the Audible Illusions preamp used for this review can handle a very low-output cartridge, it was nice using a cartridge with a healthier output -- the volume control of the preamp was at a level closer to that of the digital source. And it was especially convenient when playing an LP with a long playing time, where the mastering lab decreased the output in order to make the grooves smaller and the playing time longer. A record such as Mahlers First Symphony conducted by George Solti on Decca [SXL 6113] is a good example of this. The volume on the preamp could be turned up much less because of the cartridges higher output. Another of my initial impressions of the MC-One Special during the first few weeks was that its sound seemed awfully close to the almost universally praised Lyra Clavis DC. That there seemed to be very similar levels of transparency was the main reason for this. But there were differences too, which I'll explain. After a while living with the MC-One Special in my system, it was clear that its sound put it in a class far beyond what you'll gets from an entry-level cartridge. What separates the MC-One Special from these is essentially the quality of its frequency extremes. This sort of extension and transparency in these areas are not heard until you mount, for example, the $750 Benz-Micro Glider, and even that cartridge has a bit to go before it enters the level of sophistication the MC-One Special attains. On every record I played, the MC-One Special's frequency response was markedly free of anomalies; there were very few peaks and valleys that were patently obvious. I dont want to give the impression that for $1500 you get perfection. After a while I noticed a very slight forwardness. This was sometimes apparent as a slight peak in its upper midrange, but again, it was very slight. The MC-One Special also wasnt absolutely transparent, so if I were to assign a color to represent this, it would be a very slight cream. But creamy is not how I would describe this cartridge's overall sound. The sonic picture it painted wasnt as clear as I was accustomed to with Lyra, yet its slight dryness may have been a remnant of the peak in the mids. Again, its deviations from transparency and from textural neutrality were very slight. Its somewhat dry, analytical tendency was actually very enjoyable on much material, and simply not noticeable on others. Loudspeakers  Legacy Classic, PSB Stratus Mini, Neosonik Z3, Velodyne HGS-15b subwoofer. Amplifiers  Krell KAV-250a, Muse Model 150 monoblocks. Preamplifier  Audible Illusion Modulus 3a with gold MC phono board. Analog sources  Heavily modified Oracle Delphi, Wheaton Tri-planar VI tonearm (with Discovery cable wired directly to preamp), Lyra Clavis DC phono cartridge. Digital sources  Pioneer DV-525 DVD player (used as transport), Perpetual Technologies P-1A Digital Correction Engine, Perpetual Technologies P- 3A DAC, Meridian 263 D/A converter, AH! Tjoeb 99 CD player (used as either CD player or transport). Interconnects and speaker cables  Cardas Quadlink 5, MIT 330-plus and Terminator 2 interconnects, MIT Terminator 3 digital interconnect, MIT Terminator 2 bi-wire speaker cable. Accessories  Sennheiser HD-600 headphones, Headroom Little More Power headphone amp, PS Audio Power Plant P600 AC regenerator, Chang Lightspeed ISO 9300 power conditioner, MIT Z-Cord II power cable, Target TT5-sa equipment rack, German Acoustics cones (under preamp), 1/2" MDF -- 10 Vibrapods model 1 -- 1/2" MDF sandwich (under analog), Winds stylus pressure gauge, StaticMaster photo negative brush, LAST stylus cleaner, LAST Stylast stylus treatment, Record Doctor II record cleaning machine, Record Research Vinyl Wash, AudioQuest and VPI record brushes with which to apply record-cleaning fluid. Its bass was tight and extended, never drawing attention to itself unless that was the intention of the recording. I listen to tons of electronic music, most of it on vinyl, and most of it intends the bass frequencies to be spotlighted, so these records are very bass heavy. The double 12" of Paul Van Dykes remix of Tell Me Why [Mute 9129-0] doesnt sound as if the kick drum (the loudest instrument in the mix) and bass are pumped up past what is required; it fits in with just about every record in its genre. This record is likely to be played in clubs, and when listening to it on a home system, you are not likely to have the luxury of multiple stacks of cabinets with18" woofers. The MC-One Special was the equal of the Lyra Clavis DC in that the bass frequencies were never flabby or lacking in extension. The bass was as solid and pitch specific as this and all other recordings presented it. At the same time, it didnt let the authoritative bass overshadow the rest of the frequency spectrum. The MC-One Specials almost total lack of groove noise and distortion was proof that it is a well-designed cartridge. With lesser cartridges, these irregularities are particularly noticeable when playing classical records that have a large chorus, especially on the second half of the side when the grooves get closer to the spindle. On Brahms German Requiem, the second movement is by far my favorite section of this work, and on the EMI version with Otto Klemperer conducting the Philharmonia Orchestra [EMI SLS 821], Ive heard distortion from lower-grade cartridges during the crescendos of the choral parts. But the MC-One Special had no problem at all rendering the voices very clearly. Its tracking ability and lack of groove noise were equal to those of the Clavis DC, and combined with its greater output, these made for some very enjoyable listening sessions. But I didnt spend all of my time spinning classical music when listening to the MC-One Special. Its just that these records were a great way to test the cartridge's competence. Nevertheless, if you are uncomfortable (or just unfamiliar) with classical music, rest assured that the MC-One Special's proficiency was also evident with many rock records. Every cut on the Japanese pressing of Queen II [Chrysalis 485748] has what sounds like a thousand overdubs and an amount of compression that would be unheard of with a present-day recording. Yet the MC-One Special sailed through this record, letting me hear not just the flaws in the recording but the brilliance of the flashy glam rock that was early Queen. Groove distortion and noise can mask the details in the recording, and thankfully there was none to be heard. During the time the MC-One Special was in my system, I did not switch back and forth between it and the Clavis DC. I didnt want to risk damaging the stylus of either, nor did I have two identical tonearms that I could swap. I doubt that I would want to spend the time switching them anyway. All my comparisons between the two cartridges were based on my memory of how the Clavis DC sounded in my system -- and we could discuss ad infinitum sonic memorys accuracy -- or lack thereof. So, after a couple of months of listening, I re-mounted the Lyra cartridge. This is when it became clearer that the sonic differences between the cartridges were greater than I assumed. Before switching back to the Lyra I thought the frequency response of the two seemed quite comparable, and both seemed to be able to reproduce what was etched into the vinyl very faithfully. Yet after only a few minutes of listening to the Clavis DC again, I discovered that I was essentially correct about the two cartridges' similar frequency response, but that with the Clavis DC, these frequencies sounded more refined, especially in the treble. This was true to such a degree that this quality alone would be enough to elevate the ranking of the Lyra Clavis DC to an extraordinary cartridge rather than just a very good one. For instance, take the Clavis DC's way of making distinctions between the different sounds in the high frequencies, such as the different cymbals in a drum kit. This refinement trickles down into the lower frequencies, giving all instruments -- please excuse the audiophile cliché -- a more palpable presence. The midrange also exhibited this refinement, and as a result different instruments or voices seemed to occupy a more distinct area of the soundstage, and this soundstage was deeper and more multi-layered. The van den Hul cartridge was no slouch when it came to casting a realistic soundstage, but the Lyra cartridge bettered it in this area. I suppose I shouldnt put too much emphasis on the comparison to the Lyra Clavis DC. The difference in price between the Clavis DC and the MC-One Special is now $500 if you consider that the recently discontinued Clavis DCs replacement, the Helikon, is $2000. I guess with this 25% increase in price you still don't reach the glass ceiling of diminishing returns. The van den Hul MC-One Special is a fine cartridge given its comparatively modest price, and no doubt it has much of the sonic flavor of the much more expensive (and acclaimed) van den Hul cartridges.